"The Visegrad Group countries will assist Ukraine in implementing reforms the country needs in many specific areas which have been agreed on with our Ukrainian partners today," announced Miroslav Lajčák, Deputy Prime Minister and Minister of Foreign and European Affairs of the Slovak Republic, in the conclusion of the joint visit by foreign ministers of the Visegrad Group (V4) countries in Kyiv. "Slovakia will be the sponsor of the reforms in the area of energy security and over the security sector reform, the Czech Republic will assist with building a civic society, media and education, Poland will cover decentralization and public finance reform, and Hungary will help in supporting small and medium enterprises, and DCFTA implementation,” specified Minister Lajčák. The joint visit by V4 ministers took place upon an initiative from Slovakia, which is now the V4 presiding country. The goal, in addition to providing specific assistance in reforms, also was reiterating clear support for Ukraine in seeking a political solution to the conflict in the east of the country as well as in reforms associated with Ukraine’s possible accession to the EU. The ministers of the V4 and Ukraine adopted a joint statement emphasizing the support by V4 for the reform plans of the new government, support of territorial integrity and independence of Ukraine, and emphasizing the importance of reforms for modernization of Ukraine as well as the preparedness of the V4 to assist with preparation of the reforms and their practical implementation. 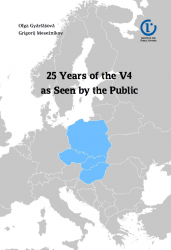 "The V4 countries are Ukraine’s neighbours and friends. We arrived to emphasize our solidarity and preparedness to assist because it matters to us that this important neighbour of ours is a stabilized, democratic and prosperous country," stated Minister Lajčák in Kyiv. “Ukraine cannot do without reforms. The EU is prepared to provide maximum and significant assistance, implementation of the reforms is up to the Ukrainians alone, and no one can do it on their behalf. We, the V4 countries, offer assistance to Ukraine drawing from our experience and expertise obtained through transformation of our societies and economies," Minister Lajčák concluded. Minister Lajčák, during the visit in Kiev and its bilateral agenda, presented a €75,000 check for humanitarian aid to Alla Khabarova, the Secretary General of the Ukrainian Red Cross Society. A portion of this aid, in form of medications and health-care supplies for residents affected by the conflict in the east, was delivered to Ukraine by the Slovak government special plane on Tuesday. The overall humanitarian aid for Ukraine from Slovakia has exceeded €800,000 this year.